Malaysia Airlines has launched a series of branded content videos featuring former MasterChef contestant Poh Ling Yeow. 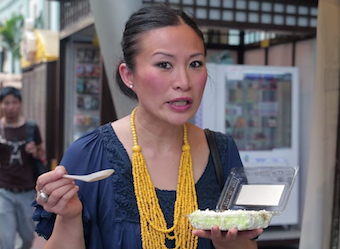 The five-part mini-documentary series is shot in the style of a travel television show, following Yeow through a trip to Kuala Lumpur. She gives various tips about the hidden secrets of the city, including its best foodie hotspots, shopping haunts and thriving market scene. Unsurprisingly, the videos also include plenty of details about airport and in-flight experience with Malaysia Airlines. Yeow is the brand’s first-ever ambassador for the airline in the region. The celebrity cook and author was born in Malaysia, where she lived for nine years before moving to Australia. Yeow says she wanted to highlight in the series the city’s unique appeal that manages to surprise her on every visit. Yeow has also created a signature dish to be served on Malaysian Airlines flights departing Australia until 28 February – Nyonya chicken curry with a roti-style croissant.